When I went to my Google personalized homepage this morning, I was shocked to see the weather module as shown to the left. Apparently, while Bradford and Pittsburgh are going to have chilly weather on Saturday, Girard is simply going to fall off the face of the earth. So, I guess I'm moving. Somewhere. I don't know where yet, but since Bradford and Pittsburgh are safe, I guess I'll go there. Maybe the same sort of thing happened to Los Angeles, home of Lexico Publishing Group, LLC. Their main site, dictionary.com, hasn't had a word of the day since Tuesday. They say that the new one is posted at 00:00 PT each day (03:00 ET). We're now approaching afternoon and there isn't even one for yesterday yet. Oh, well. 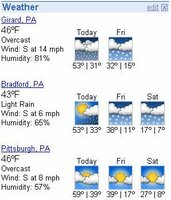 Actually, the whole reason for the Google glitch was because they're forecasting a chance of snow showers for Girard on Saturday, with a high of 21° and a low of 11°. Apparently, because it was the only one of my three selected cities with a double-digit forecasted low, it was too big to fit in the module (just by a little bit). Google, being "smart," decided to leave off the entire day rather than cut off the low temperature. i haven't gotten a dictionary.com word of the day since i don't know how long! :-P i don't remember, it might've been like tuesday or monday or something.